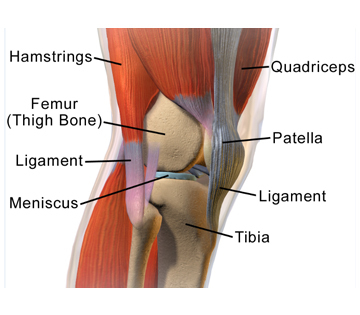 The meniscus is the portion of cartilage that functions as a cushion for the knee joint. A common injury is a tear of the meniscus and can result in pain, stiffness, swelling, and difficulty moving. Although rest and medication can help to alleviate these symptoms and are sufficient for small tears, full recovery for larger tears requires surgical intervention.Meniscus repair surgery is often the best choice for larger meniscal tears that are relegated to the outer edge of the meniscus or have moderately spread to the inner layers. The surgery consists of assessing the damage and suturing the edges of the tear of the meniscus back into place and allowing the tear to heal naturally afterwards. Before considering surgery, the patient must have the severity of the meniscal tear assessed in order to determine whether or not surgery is necessary and to decide which kind of surgery is needed. If meniscus repair surgery is decided upon, a physical examination will be performed and the patient will be prescribed pain medication. The patient will also have to undergo a battery of tests including: bloodwork, X-rays, MRI, EKG, and medical anesthesia to properly prepare for the surgery. It is also advised that the patient neither eats nor drinks after midnight the night before surgery. One type of surgery that is used to repair meniscus is open surgery in which the knee is completely opened so that the surgeon is able to see the tear and repair it. However, this form of surgery is declining in popularity due to the introduction of arthroscopic surgery. This procedure involves making a small incision and inserting a camera into the opening in order to visualize the surgical site without creating a larger opening. Appropriately sized surgical instruments are inserted through the opening and the meniscus is sutured together. Sometimes a partial meniscectomy is performed to remove unneeded tissue. The surgery itself lasts approximately 1 hour. Following the surgery, the patient will be advised by to limit motion of the knee unless absolutely necessary for a period of 2-4 weeks. Undergoing physical therapy is recommended in order to help the patient regain skills and return to full function. The timetable for returning to full function will vary depending on the success of the therapy and on the patient’s individual needs as assessed by the doctor. Recovery rates may also depend on the age of the patient and whether or not the patient has previously suffered from arthritis or other ailments that may have affected the knee joint prior to surgery. The typical risks and side-effects of a surgery apply to meniscus repair. These include infection, excessive bleeding and damage to tissue around the surgical site. Risks and side-effects specific to the surgery may include blood clots in the leg and damage to blood vessels around the knee.